Disclaimer: this article contains descriptions of self-injury, anxiety, and depression. If you are in crisis, please see the resources at the bottom of the article. Not a ton of people expect a 12-year-old to suffer from addiction. Until recently, I didn’t realize that what I have been going through for the past six years had been just that. During a time of difficult transition, from being friends with everyone in elementary school to sitting at a lunch table with three to four people, I turned to a coping mechanism which has permanently affected the latter part of my life. They say that emotional pain creates some of the clearest memories, and I remember the first time I self-harmed with the most cloudless vision imaginable. My lack of self-esteem sent me into the darkest place that I had yet to meet. Addiction coming slowly, then suddenly plummeting me into such a dim and scary place, one where I found myself leaving family dinner to get a quick fix off of hurting myself. I hated going to the pool in the summertime. It hurt telling anyone what I was going through, so I didn’t. For the months following my initial experience with self-harm, I felt like no one cared enough to ask me about it. When in reality, no one knew what I was going through, and as painful as it is to admit, it was my fault. I moved to my legs after someone asked me what happened to my arm. “I fell down a tree,” I said. As mentioned before, my addiction to self-harm has been a part of me since I was 12, and to this day, there is nothing I regret more than introducing it into my life. But in the fall of my senior year, I had reached my highest point. I hadn’t hurt myself in six months, which was the longest duration in which I’d been “clean” since my first time self-harming. It took using all of my strength to open up and address the problem with painful honesty. And at the end of November 2018, just a month after my six month winning streak, I relapsed. The people whom I had told about my addiction during my lucky strike were confused. I thought I had finally beat the habit that had been a part of my life for six years. To be honest, I was confused, too. I had a loving boyfriend, friends who knew about my now-diagnosed mental illnesses and a family who did everything to help me get better. I was applying to my dream colleges with the GPA that I had worked so hard for. I think that it may have been the fact that, although I had everything I had ever wanted, I was still depressed, and that didn’t seem too fair to me. It’s necessary to also mention that I had just started a new medication for my depression and anxiety. On this new pill, I lost at least 10 pounds in a week. I couldn’t sleep and I felt like throwing up every 30 minutes. Over the years, I’ve learned now that treatment isn’t one and done. It’s trial and error, which can be painful sometimes. 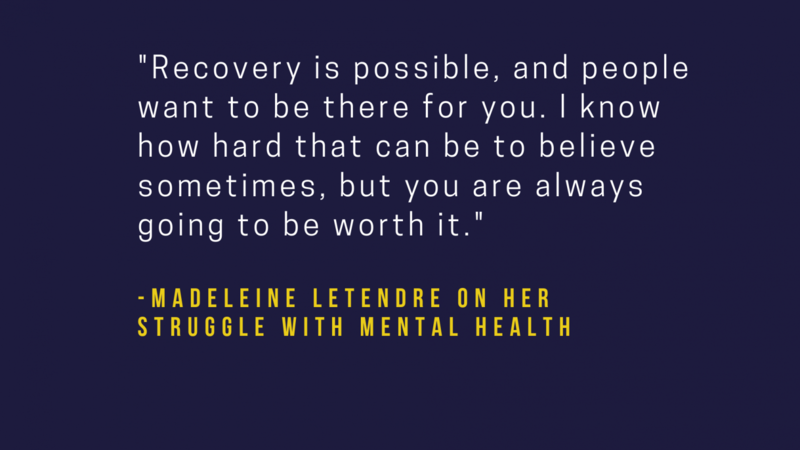 Nonetheless, everything I worked so hard to overcome– talking to counselors, teachers, friends, medical professionals and family to help me get back on track– seemed to mean nothing. As much as I wanted to believe it was my fault, it wasn’t. I knew deep down that the reason I relapsed wasn’t because I really wanted to do it, but what was scary was knowing that and not believing it. Depression seems to do that a lot: try to convince you of something that you genuinely know is not true. I could see all of the people around me giving me their love, and I couldn’t feel any of it. Since the relapse in November, though, I haven’t hurt myself again. What it takes is calling a friend, family member or talking to a counselor when you feel the urges to fall back into dangerous coping mechanisms. At first, I didn’t want to. Sometimes I still don’t want to. It’s a mix of shame, guilt and perhaps the fact that self-harming gives me that little release that I’ve been craving, and I don’t want to lose that or admit it. I know that when you’ve reached the depths of addiction, scars don’t seem to matter. That’s why I have so many. Sometimes I still don’t like going to the pool. The most important part was the hardest part: reaching out. I was losing an opportunity to seemingly “numb the pain” when I did so. But as much as I didn’t want to admit it, it was impossible for me to benefit at all in the long run from injuring myself. This took time, but please, understand that it’s possible. I know that time can be a scary concept when you’re hurting so extensively. I didn’t want to call this a success story, but to be honest, it is one. Each day that I go without hurting myself is another big victory. Every time I ask for help, that’s a big deal. I know that most times, asking for help seems impossible. Really. But, trust me, experimenting with self-harm holds the potential to turn a one-time thing into a lifelong battle. That battle is hard, but it can be won. Self-abuse is ugly. Like alcoholism or drug addiction, you quickly descend into a problem that consumes every minute of your day. Hurting myself is all that I could think about. All the time. But inflicting physical pain upon yourself doesn’t numb the pain of depression, anxiety or whatever it may be, forever. In fact, the pain seems to get worse. Take it from me. It becomes addicting, and soon you will look at yourself and wonder when it got so bad. I will hold these scars with me for the rest of my life. If you are thinking about self-harming or currently self-harm, please, please ask for help. I know it may take every ounce of strength in your body to do so, but you don’t deserve the pain that you’re in. Recovery is possible, and people want to be there for you. I know how hard that can be to believe sometimes, but you are always going to be worth it. Text CONNECT to 741741 anytime about any type of crisis.